The expression “Hair of the dog” is one that would likely sound strange to foreigners or aliens dropped into our midst the morning after we’ve been over-served, but many partiers know it refers to drinking more alcohol in order to lessen the effects of a hangover. According to David Zulberg, author of “The 5 Skinny Habits: How Ancient Wisdom Can Help You Lose Weight and Change Your Life Forever” — who piqued my interest in an email with a subject line that read “How not to lose to that dreaded hangover” — the hair of the dog expression originally referred to treating a dog bite by placing hair from that dog into the wound. Personally, I’ve always preferred a chili burger and a side of cheese fries, but that’s another story. But based on what Brewer wrote, it would seem the original cure for a hangover was to drink the specific alcohol that caused the hangover in the first place. For example, if you drank tequila, you would drink more tequila in the morning. Shudder. Asparagus: In one Korean study, asparagus extract was found to boost levels of enzymes that break down alcohol. Research suggested eating it before a hangover sets in, but eating it the next day may also help. Ginger: A small dose of ginger may help ease constipation, gas, bloating, indigestion and even vomiting. Eggs and vitamin B: Eggs contain an amino acid that can break down toxins in your body. Eggs are high in B vitamins, which an Annals of Internal Medicine study found can reduce hangover symptoms. Bananas: Alcohol consumption may cause the loss of potassium in the body. Bananas increase your potassium levels. Sprite and lime: Chinese scientists examined 57 beverages and concluded that lemon and lime drinks performed the best at helping the body process alcohol. 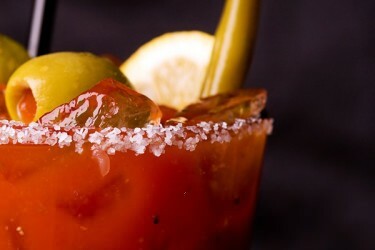 Virgin bloody mary: Maintaining adequate blood sugar levels is often hampered, as your body metabolizes alcohol. A glass of tomato juice injects simple sugars into your system. Hydrating with loads of water and a couple of aspirin before I go to bed has often worked for me. If all else fails, you could give that morning chili burger a try. I have no scientific theories or anatomical explanations to offer for its success, other than that it tastes good and makes me just tired enough to want to go back to bed and sleep away memories of the dog and its hair all together.